The UK online grocer’s pre-tax profit fell in the first half and net debt is rising. Its big dream of selling cutting-edge technology to other retailers generates less than 10 percent of revenue. Rapid delivery is imperative at a time when Amazon is prowling the aisles. 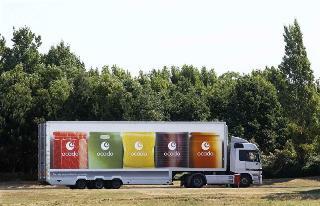 An Ocado truck leaves the Ocado depot in Hatfield, southern England. Filings from major shareholders last week revealed existing investors took more than one-third of the online grocer's initial public offering. Online grocery delivery group Ocado on July 5 reported first half pre-tax profit of 7.7 million pounds, down 9.4 percent compared with a year earlier. Revenue in the 26 weeks to May 28 increased 12.5 percent from a year earlier, to 659.6 million pounds. Net debt rose to 102.4 million pounds at the end of the period, compared with 14.6 million pounds a year earlier. Chief Executive Tim Steiner said Ocado had seen a pick-up in enquiries from U.S. supermarket groups interested in possible partnership deals in the wake of Amazon's $13.7 billion deal to buy Whole Foods. “…we’ve seen increased interest in our (technology) solution from players in the U.S.,” he said. Ocado pioneered the use of software and automation to pick online grocery orders in huge warehouses, rather than by hand in stores. The company’s shares were up 1.2 percent by 1000 BST on July 5.